1) Where are you originally from and how long have you been living in Berlin? I was born in Heidelberg (in the federal state of Baden-Württemberg) and for a long time I lived in or around this wonderfully romantic town. I also studied at the University of Heidelberg and worked there as a lecturer. I started working at ECLA in 2003 and moved to Berlin in 2005. 2) In which district do you live? Tell us a bit about it. Why did you decide to live there? 3) What were your first impressions of Berlin? Have they changed over time? I was very impressed by the size of Berlin, the variety of its culture and some of its extraordinary architecture. The historical heritage of Berlin is, of course, also very impressive. The history of Germany and Europe is very much present at the many historical sites; sometimes Berlin appears to be like one great museum of history, a living, breathing exhibition of both the greatness and the major failures and tragedies of European history. I like the urban feel, the metropolitan character of this city, which in a certain way reflects the bliss and bane of modern western culture in general, everything we should love and everything we should hate about modern life and society. One gets used to everything, even to a city like Berlin. The fact that I‘m no tourist here, but have to live and work in this environment makes it „easy“, as it were, to filter all the idiosyncrasies of Berlin and to slow down extra activities. When I moved to Berlin I had the illusion that I’d explore the city every week (or weekend) and take advantage of all its cultural offers and luxuries. But, in fact, one ends up rather quickly focusing on work (even on weekends) and on the absolutely necessary (not always pleasant) things one has to do. Thus, unfortunately, there is not always enough time to do all the interesting and compelling things in Berlin I wanted to do when I came here. 4) Let’s now turn to the rich film tradition in and about Berlin. On the 18th of September you organized an already traditional “Berlin Film Night” at ECLA of Bard, a film marathon comprising Berlin – Symphony of A Great City (Germany 1927, dir. Walter Ruttmann), One – Two – Three (USA 1961, dir. Billy Wilder) and Berlin Symphony (Germany 2002; dir. Thomas Schadt). Do any of these or other films do justice to the “real” Berlin? Is there a cinematic version of Berlin that you find particularly successful? These three films about Berlin are all certainly successful in their very own and specific way (always depending on the artistic intentions of the filmmakers). There are other films, too, that succeed in giving a specific impression of Berlin and its political or cultural climate in a given time period, for instance “The Spy Who Came in from the Cold“ (1965) by Martin Ritt, or “Cabaret” (1972) by Bob Fosse, or “Christiane F. – Wir Kinder vom Bahnhof Zoo“ (1981) by Uli Edel, or “Wings of Desire“ (1987) by Wim Wenders, or “Oh Boy” (2012) by Jan Ole Gerster. Since film is only one form of representation, it is, by nature, restricted; and I doubt that one film alone can ever do justice to the „real“ Berlin. (What is the „real Berlin“ anyway??) But, thank God, we have a tradition of Berlin films so we can add all the available cinematic stories, portraits and depictions of Berlin to an ever growing visual exploration of the city and its significance in (global) culture and history. 5) How would you explain the fact that Berlin has been so attractive to film-makers and film-lovers in general? There are certainly historical reasons. In the 1920s and 1930s one of Europe‘s biggest and most successful and influential film production companies grew and thrived in Berlin and Potsdam/Babelsberg, the Universum Film Aktiengesellschaft (UFA). There was a lot of artistic (and technological) potential that was ruined by the Nazis as the majority of creative people left Germany and went to the US or were expelled from the film industry or were killed in Concentration Camps. After the reunification in 1990 and the re-establishment of Berlin as capital, the German film industry and dedicated lobbyists tried to resurrect the film business in Berlin, and thus a lot of money was invested, for instance to reactivate and modernize the Babelsberg Film Studios and to bring international film productions to Berlin by means of financial support and film subsidy by the government and the federal state (“Filmförderung”), which created very lucrative conditions for film coproduction. Like all capitals or major cities in the world, Berlin offers a lot of interesting and visually fascinating locations, where stories about life in modernity and urban culture could be set; plus its significance as central spot for so many historical events of political processes. For young or independent filmmakers, Berlin also offers opportunities and networks that facilitate work. Berlin does attract all kinds of artists and people seriously interested in various forms of art; I think film is no exception here. I guess this combination of historical significance in general and Berlin’s fame or legacy as one of the film capitals of the world, of having an international aura, open-mindedness and creative pulse in principle, in addition to promising film production conditions, make the city an attractive location for filmmakers and film aficionados. 6) Do you go to Kinos to watch films or, on the contrary, prefer a private setting to movie theaters? Do you have any favorite Kino(s) in Berlin? I go to cinemas to watch films, but unfortunately there’s not enough time to go very often or regularly. Because of my profession I have to watch a lot of films back home or in my office: when I’m working on a research project – or when I have to prepare classes – I watch, for example, two or three or more films a day, or sometimes only parts of films searching for a scene or a single shot that could be used in a specific meaningful way. Very often I have to watch or re-watch quite a number of films till I find what I’m looking for. Watching films on a VHS player, a DVD player or a computer, where you can stop the film any time, repeat scenes, write down some notes in between etc. is, of course, very comfortable and immensely convenient. Without these possibilities to stop and restart a film, to watch selected parts again and again, academic work in the field of film studies would be almost impossible. Thus a private setting (at home or in the office) is much better for doing this kind of work than going to a cinema. Favorite Kinos in Berlin? No, not really. I used to go to “Blauer Stern” (which is not as bad as it looks from the outside! ), and I like to go to “Colosseum” on Schönhauser Allee and “Kino Arsenal” at Potsdamer Platz. But when I go to the cinema I go because of the film (i.e. the current program) not so much because of the cinema itself. 7) What about film festivals? Any entry at Berlinale 2013 that appealed to you? Any predictions for 2014? Film festivals, especially the Berlinale, are awesome; sometimes, however, they are overrated. Concerning films, I always like to wait for three to five or more years: if people then still talk about a film, this really might be an interesting and convincing one that is worth spending time and money. 8) As ECLA of Bard students, we are always eager to experience more of what this city has to offer, and since you have spent more time in it, we believe you might have great insight into what places make it special, or comfortable for a city dweller. a. Tell us about one place in Berlin that you believe is rich in history or is meaningful to your personal history. An interesting place to go is the cemetery Dorotheenstädtischer Friedhof, because here one can find the graves of so many famous and important people (for instance Hegel, Fichte, Brecht, Heinrich Mann and – since recently – the actor Otto Sander) and one can muse about greatness in life and equality in death. It’s a reminder that – no matter who you are and what you achieve in your lifetime – we all share the same fate ultimately. Since I spent my formative years not in Berlin, there are no places here that are really seriously meaningful to my personal history. 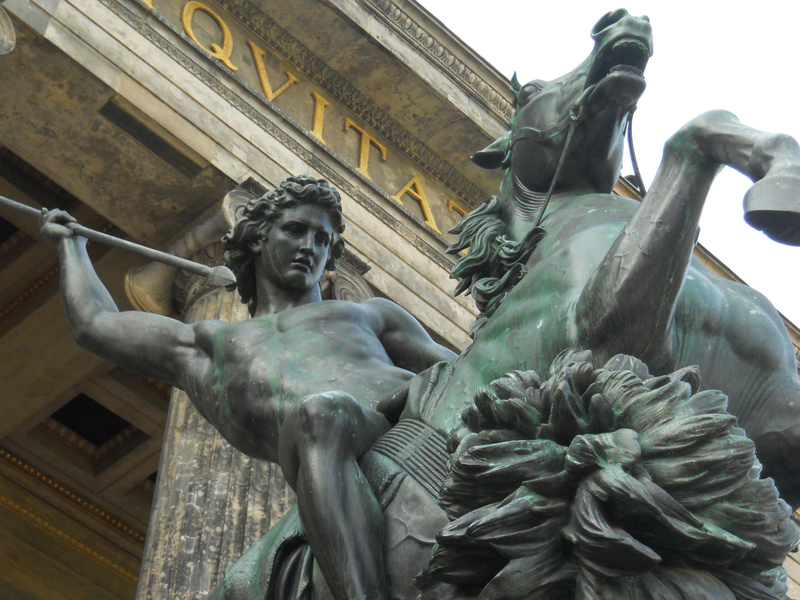 There is one thing, though, that does have a certain (sentimental) meaning: the statue “Löwenkämpfer” (“Lion Fighter”) by Albert Wolff flanking the entrance of the Altes Museum. I wrote my first art history essay about this neo-classical bronze statue … many years ago! b. What would your recommendations be for spots to read a book? c. What are some of your favourite places to enjoy a meal? Oranium (Oranienburger Straße), Francavilla (Dietzgenstraße), and, of course, the ECLA of Bard Cafeteria (Waldstraße). d. What would your ideal Sunday in Berlin be like? I think I shouldn’t talk about this publicly. I will contemplate about it by myself and enjoy my imagination. The local cinema [author’s note].